We made Minions Munch as part of my Fandango Family Ambassadorship. I was compensated for my participation however all opinions are my own. One of the things the kids and I love to do together is make easy snack mix recipes. I love it because it gets them involved in making a snack or treat with me. It’s a safe and easy way to get them in the kitchen! And it doesn’t take much time if you start out with mostly pre-made ingredients! Check out what we did in honor of the new Minions movie coming out! Now that he’s seen a few commercials and the movie preview a few times, Weston is so excited about seeing the Minions in theaters soon. He’s really just starting to get into movies so he hasn’t had the pleasure of enjoying Despicable Me or Despicable Me 2 yet. So I think I know what we’ll be doing during quiet time this week! 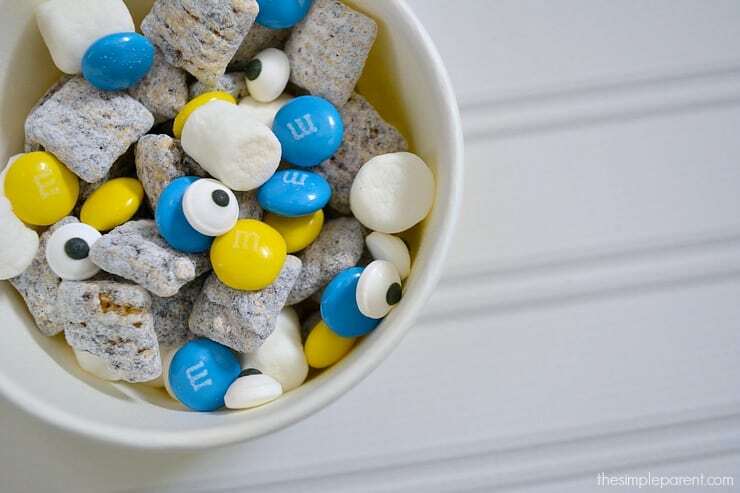 But to build excitement, we put together another one of our easy snack mix recipes that has a Minions theme! 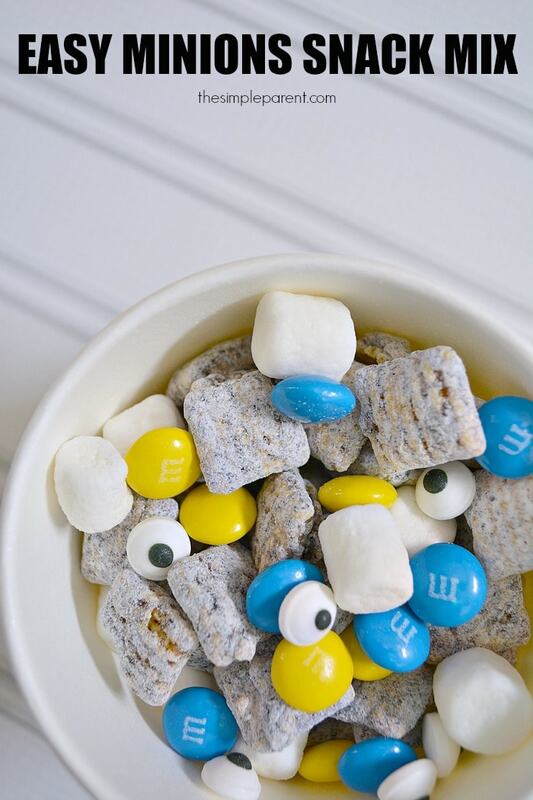 Pour the Muddy Buddies, M&Ms, and marshmallows each into individual bowls. 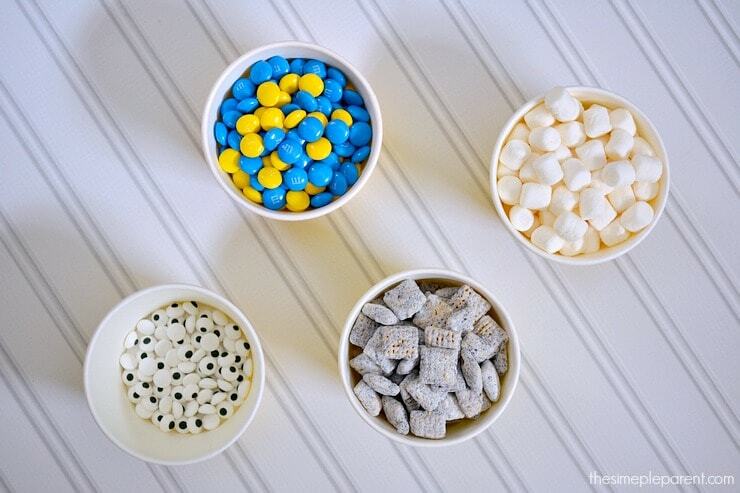 Allow kids to scoop some of each ingredient into their own bowl. This is a great snack mix for playdates or parties because you can either throw together a big bowl of it or you can let the kids make their own little bowls like we did. Either way, it’s super easy to prepare for and make. And it’s so delicious! I might have eaten a bit more than my share! But I think I’ll just blame those silly Minions! And if you haven’t seen any of the fun previews yet, be sure to visit the Minions on Fandango for a great overview and some fun clips to watch with the kids! The movie is rated PG and has a running time of 1 hour, 31 minutes. And if you’re looking for more fun, check out these other DIY Minions activities! Minions opens in theaters on July 10th and is perfect for the whole family! The eyeballs killed me! It’s a great touch.